A car loaded with gas canisters detonated in a busy section of downtown Stockholm today, followed by another explosion 10 minutes later caused by a suicide bomber. After the explosions, the bomber was found dead lying about 300 yards away from the car bomb, reportedly wearing a suicide vest and a backpack full of nails and surrounded by the remains of pipe bombs. The bombs apparently were inexpertly crafted and failed to detonate to full capacity. Two people were wounded in the bombings, which took place in a street filled with Christmas shoppers. Only minutes before the attacks, the Swedish Security Police (SAPO) had received an email warning, with sound files in both Swedish and Arabic, referring to the presence of Swedish forces in Afghanistan and to the cartoons of the Prophet Mohammed by Swedish artist Lars Viks, Reuters reported. “Our actions will speak for themselves, as long as you do not end your war against Islam and humiliation of the Prophet and your stupid support for the pig Viks,” the speaker threatened on the tape, as reported by Swedish news agency TT. The message threatened the Swedish state and its people, according to the BBC, saying the time had come for them to die “like our brothers and sisters.” It also exhorted militant Muslims in Sweden and Europe to rise up against the West. The Long War Journal notes the similarity of these attacks to the attempted Times Square bombing a few months ago, indicating perhaps another attack by the Tehrik-e-Taliban Pakistan, the Pakistani Taliban. Sweden had been on high alert for several weeks, as a Mumbai-style attack had been feared in Europe for several weeks. And you can bet, in politically correct, multiculturalist Sweden, Swedish authorities, media, and the intellectual elite will put the blame for this anywhere but where it rightly belongs: the doctrine of jihad fi sabil Allah (“War for the sake of Allah”) and the supremacist, separationist, and aggressive attitudes toward non-Muslims built into Islam. Until our leaders recognize the religious aspect of a war that’s been going on for over a thousand years, these attacks are going to happen again and again. They are still trying to kill us. LINKS: More from Moe Lane, Jihad Watch, and Hot Air. UPDATE: The Jawa Report has video. Big Peace calls it the Christmas jihad. I’m willing to bet the attacker wasn’t Episcopalian. Note to Trey Parker and Matt Stone: If you haven’t hired full-time bodyguards yet, this is your wake-up call. But don’t you dare say Islam isn’t a religion of peace. Typical of fascists and other would-be dictators, Islamic supremacists use intellectual bullying and physical violence to stifle criticism and cow opposition to the spread of sharia law in free lands. The hope is that enough shouts of “racist” and “Islamophobe,” coupled with acts of violence and murder, will intimidate non-Muslims into submission and self-censorship. Islamists do not wish to debate their opponents; they wish to silence them. This means demonstrating the high costs, whether legal or physical, of speaking out. Recent news items show how the fear of violence can drive capitulation — and, therefore, how violent Islamism can advance, rather than inhibit, the work of stealthy, nonviolent Islamists to crush free speech. 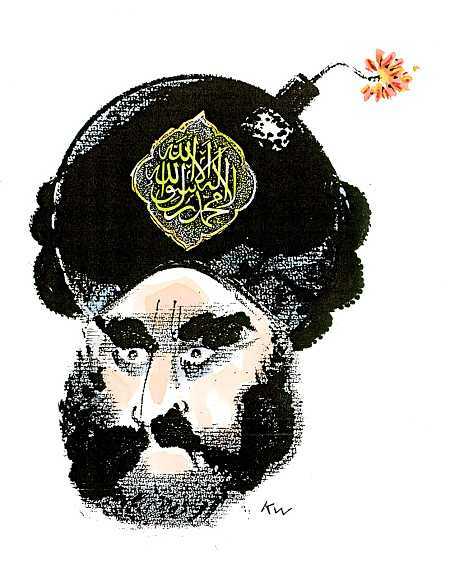 Following the global riots of 2006 and a flare-up two years later, caricatures of Muhammad once again are stirring jihadist passions. Two Chicago-area Muslims were charged last October with planning terror strikes against those involved in the publication of the Danish Muhammad cartoons. New Year’s Day then saw an attack on the home of Kurt Westergaard, creator of the infamous bomb-in-the-turban illustration. Read the whole thing; the author has many good examples. For another, have a look at this article on Islamic lawfare, the use by Islamic supremacists in the courts and international law to criminalize and punish those who would speak against them.